PE will be debuted in tonight's nationally televised game against the Celtics. 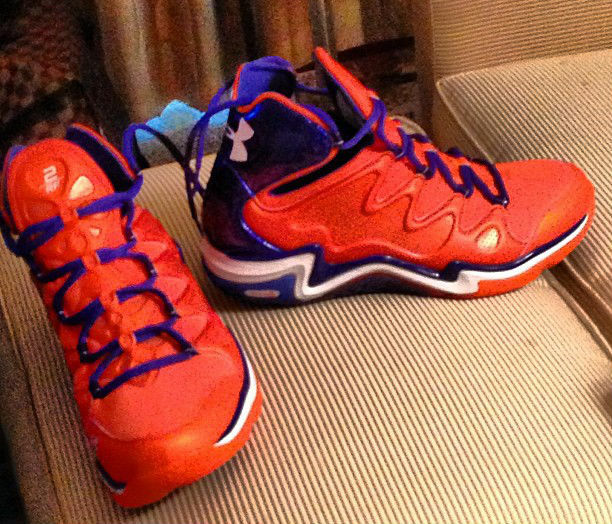 In tonight's nationally televised matchup against the Boston Celtics, New York Knicks point guard Raymond Felton will be debuting a Player Exclusive colorway of the Under Armour Charge BB Low. Felton's PE sports a bright orange contoured upper with a metallic blue heel and additional blue hits on the laces, inner lining, midsole and outsole. White also works some of the midsole, Under Armour branding on the heel and "RF 2" personalization on the tongue. Kemba Walker was the first player to wear the Charge BB Low during All-Star Weekend. The model is expected to be part of Under Armour's Fall '13 lineup. Knicks/Celtics top off tonight at 7:00 p.m. EST on TNT.